Find the newest jobs in Perth and WA, including mining jobs, building and construction jobs and retail jobs. 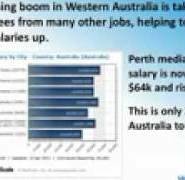 Jobs in Perth and WA for jobseekers. Search Mining jobs, Oil & Gas, Construction, Retail, Banking and Medical jobs. Post own job ads free resume downloads. Call us at (08) 9322 9722.